This week I was determined to figure out what the heck to do with our fireplace. It was driving me insane. Our fireplace has looked like this for almost a month now. I just could not figure out what I wanted to do with it after taking down Christmas other than to paint that mirror. I took down the larger mirror that is normally up there and replaced it with this taller skinnier mirror. I felt it was time to change things up after three years. I had The Hubster help me get the newest mirror down so I could paint it. This is what I came up with, an inexpensive trumeau mirror. I am not quite happy with it. The detail at the top is just not right to me so I think I am going to be looking for a more ornate piece to replace it. It had an awesome piece on it at some point in time because I could still see the outline of it. I hate that it was missing. 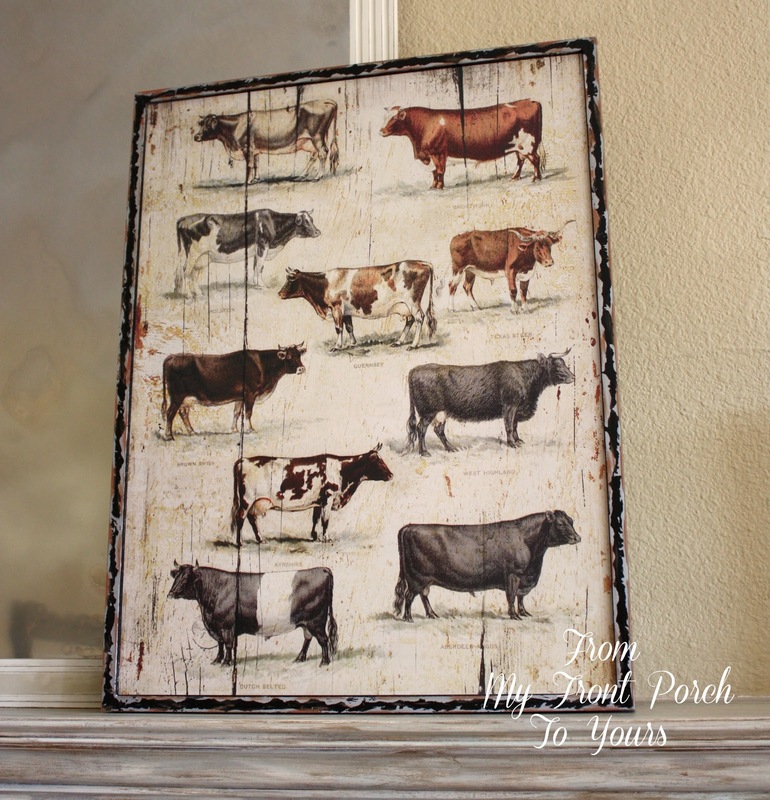 I ordered this faux vintage cow print back in November from The Antique Farmhouse. I originally was going to put it in the laundry room but it didn't make the cut in the end. 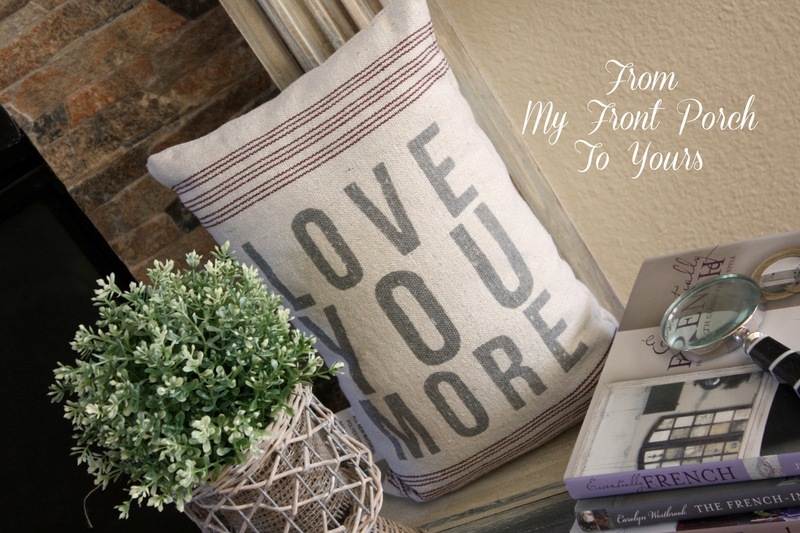 I am trying to lighten and brighten things up in our home and this Ralph Lauren pillow plus its twin hopped in my cart while at HomeGoods one day. I layered it with a cloth napkin I purchased from Pier One. I am thinking of making a pillow with it but for now I like it here. My new little grain sack table that I shared last week found a home right here. 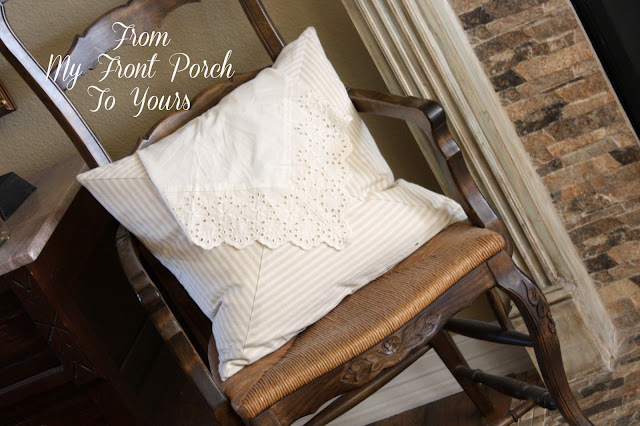 I added this cute little pillow from Decor Steals to complete the vignette. I love it! You find the greatest accessories! Happy Weekend to you! Luv it!! The mirror, the chippy corbel, all of it. But I can empathize... since Christmas I have changed mine 3 times :-( I can't seem to get the feel I am after. I luv yours though. If you tire of it... send it my way .. hahahahaa. Here's to a GREAT Friday Pamela. I think it looks really pretty, Pamela! I do love that mirror! Your mantel looks great. I know what you mean though, I'm changing things up constantly. It motivates me to clean... and I like change. Hope you are having a GREAT week Pamela! 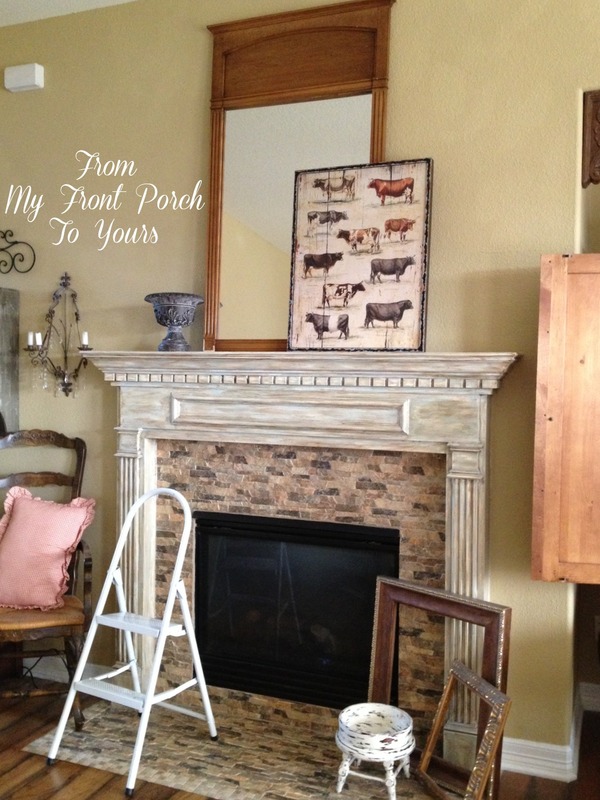 Pamela, your mantel is looking wonderful!! I'm trying really hard not to covet your chippy corbel (because I know I shouldn't covet things) but I can't take my eyes off of it. From the chippy white paint to the hint of blue and green... it is fantastic! I Covet Your Corbel!!! I will repent later after I stare a little longer. Pamela I love that cow plaque! I think your mantel looks great! I love your mantel the way you have it but know what you mean when you just can't get the look/feeling you want. To me that means it's time to walk away for a bit, it's just not the right time to get the feeling you want. Since I took Christmas off our shutter shelf (my answer to a mantel) I redid it 2 or 3 days after, but still not happy with it. Just acquired a couple new geegaws so maybe they'll work. I'm shopping the house and whatever goodies I can find, put them together when it feels right, see what happens. Give yourself time to get that good feeling. Do you have to have it done sooner? Your mantel looks beautiful and I love the reclaimed corbel. I'm in love with anything with a cow on it so I love your cow pic. 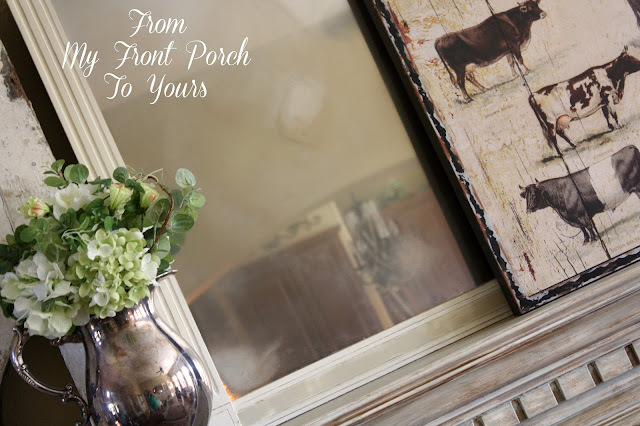 If you are not happy with the applique on top of the mirror maybe you could put a pretty wreath applique with swags, I found mine at diychicgirl on Etsy. She has some wonderful appliques that look fabulous on anything. Pamela, I love this, it is so warm that mirror is just gorgeous. Oh Pamela, that mirror transformation is fabulous!!! I think the detail is wonderful! and your cows are perfect there!!!! Hi Pamela - Thanks for leaving such a nice comment about my striped desk and chair. 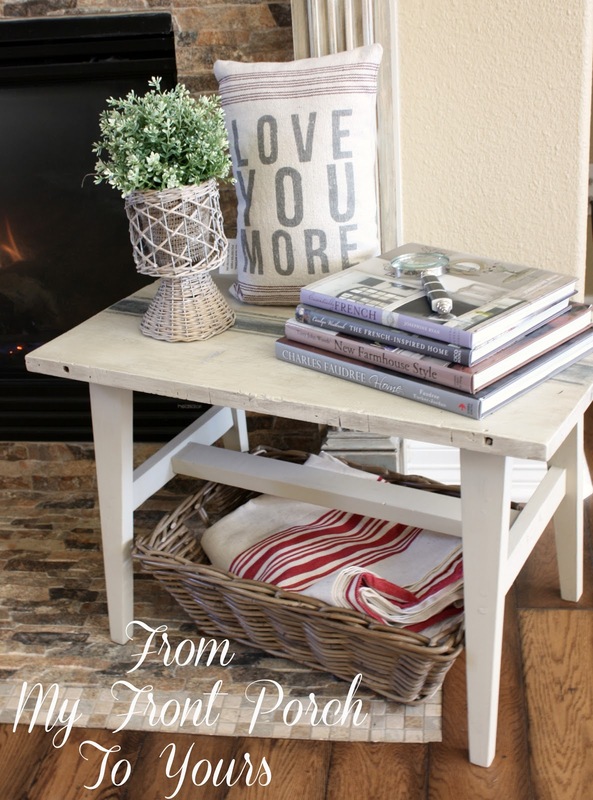 Your 'Winter Fireplace' is so warm and inviting. Love the cow print. It's nice how it picks up all the colors from the other placed items. Very Nice. I think it looks great. I especially like the cow print you have up there. So nice to visit with you tonight. Love, love, love! I want your corbel and grain sacks! They are beautiful! Thanks for stopping by my blog earlier! 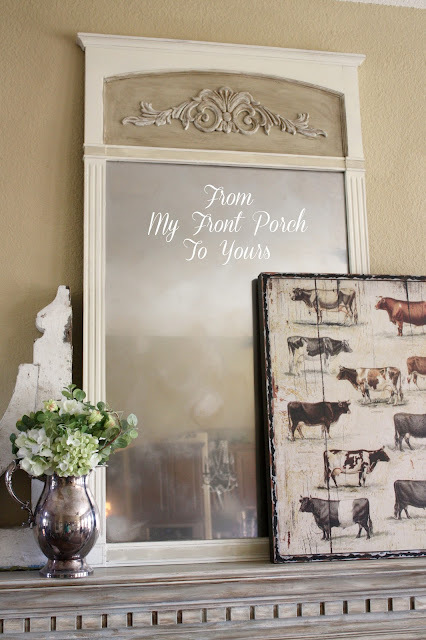 I like it, and what great finds the mirror and the cows picture. Sometimes walking away for a while gives you a whole new perspective. Great, great, great! 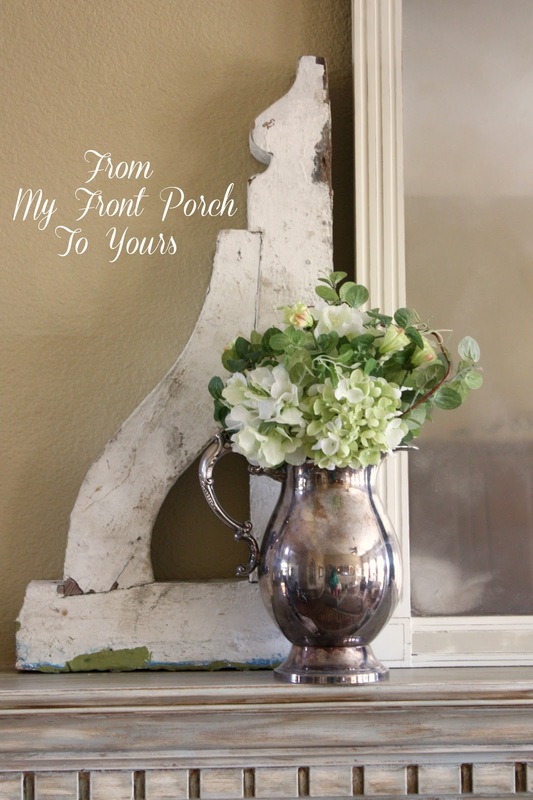 I adore that chippy corbel, and your pillows are darling, Pamela! Hi, your photos are amazing! 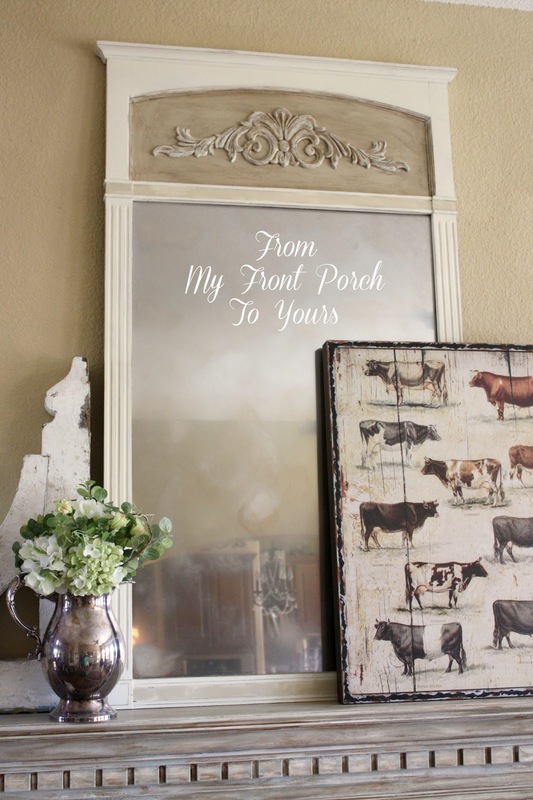 I love the mirror over the mantle and your grainsack table. Your house is very refreshing! This looks great, Pamela. I love your new cow print.